Every part of the country has its own hot dog tradition. Some dogs are garlicky, some are deep red, some are long and skinny, and some are short and stout. But no matter what kind of hot dogs folks favor, they always taste better grilled. Since it’s National Hot Dog Day, we thought take delicious hot dogs a step further…by adding a big spoonful spoonful of smoky chili and a grill-toasted bun. 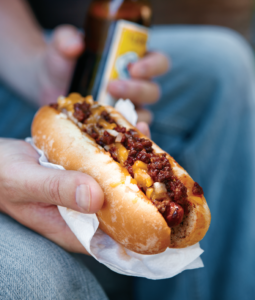 We highly recommend you join us in celebrating National Hot Dog Day this delicious recipe for Chili Cheese Dogs! 2) Prepare a charcoal or gas grill for direct grilling over high heat (page 16 or 18). Brush and oil the grill grate. 3) Place the hot dogs on the grill directly over the fire and cook, rolling the hot dogs every few minutes, until heated through, about 5 minutes. Then ask the guests how they like their hot dogs. Some will want them burnt and puffy, some will want them a little blackened, and some will want them exactly the way they are right now. Remove the hot dogs according to the answers you get. Place the buns, cut side down, along the edge of the grill and grill for a minute or two until toasted. 4) Place a hot dog in each bun and top with the chili, cheese, and onions. Serve at once. Prepare a charcoal or gas grill for direct grilling over high heat. Brush and oil the grill grate. Make chili; keep warm or reheat before serving. Set up grill for direct grilling over high heat. Shred cheese and chop onion. Don’t forget Keep a close watch on the hot dogs as they grill—even this delicious chili won’t mask the taste of burnt dogs. 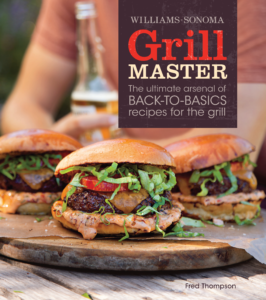 For more delicious, grilled recipes pick up your copy of the Grill Master cookbook! Want to try another recipe from Grill Master? Check out this cheeseburger recipe!